We all know people who consistently order their salad dressing on the side. You may have even done this yourself. As a weight-loss strategy, it's not a bad idea. Restaurant salads in particular are often drenched in high-calorie sauces that may even contain high amounts of sugar. But it turns out that if your ultimate goal is to be healthy, not just to lose weight, you should make sure that at least some of the dressing makes its way onto the salad. Here's why. According to research conducted at Iowa State University and published in the American Journal of Clinical Nutrition, just because you're eating your vegetables doesn't mean you're getting all their benefits. In fact, those healthy choices can pass right through you without passing on all of the amazing nutrients they contain. That's where salad dressing comes in. According to this study, adding oil helps your body absorb micronutrients from vegetables. In particular, it promotes the absorption of alpha and beta carotene, lutein, lycopene, and two forms each of vitamin E and vitamin K. It also helps you get more vitamin A, thanks to the increases in alpha and beta carotene, which the body needs to form the vitamin A in the gut. I've written about these nutrients before, so you know they have a number of health-promoting benefits, ranging from protecting your eyesight to preventing cancer. And the research found that the more oil you add, the more nutrients you absorb, maxing out at about 32 grams of oil, or just over two tablespoons. 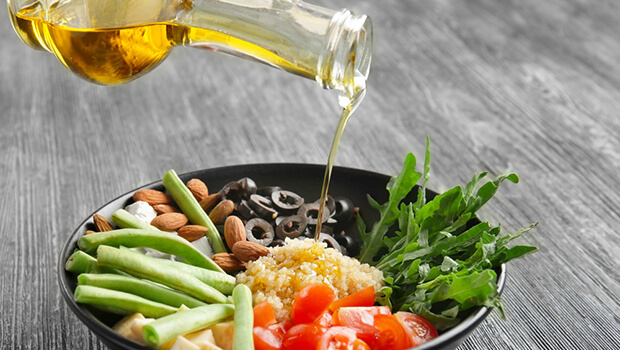 This study tested nutrient absorption by giving the participants soybean oil, which is commonly found in prepared salad dressings. As I told on Thursday, I'm not a big fan of this type of oil. I'd rather you choose olive oil, which can serve as the base for a variety of healthy and delicious homemade dressings. And it's readily available at most restaurants too. Try asking for it on the side with some lemon slices. You'll get plenty of flavor and nutrients without added sugar or the detrimental effects of commercially prepared soy.